The education programme is an integral part of our daily CRP management. We believe that school-aged children, as the ‘Passengers of the Future’, must be able to access and understand the rail network. We offer a comprehensive and adaptable education programme, and have reached over 5000 children in 100 schools to date. 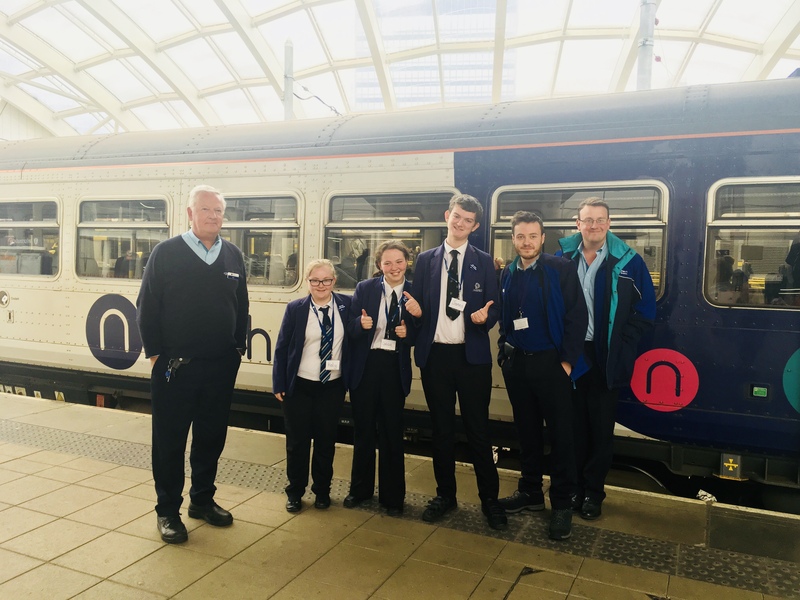 Our key programme involves a visit by us to your school, followed by a guided train journey on another date. All activities are closely linked to National Curriculum objectives. More information can be found within the ‘schools’ section of this website, along with examples of work in the ‘stations’ section. We are fortunate enough to have an excellent partnership with the British Transport Police, and work regularly with Officer Dax to engage children in the topic of rail safety, and ensure all young people have all the knowledge they need to use the railway. The programme was ‘highly commended’ in the Outstanding Teamwork category at the 2016 National Rail Awards. The presentation is variable, age-appropriate and includes dialogue about the consequences of a criminal record, delivered in a meaningful and approachable way. Best of all, the programme is completely free of charge! 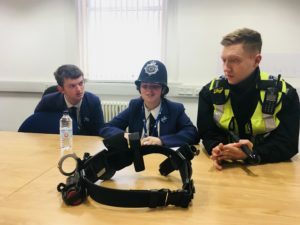 If you are interested in engaging your class or school in our programme, please get in touch at www.downtheline.org.uk. The CRPs are ‘managed’ on a day to day basis by Richard Watts, Rail Development Team Manager with Lancashire County Council. Alongside Richard are two Community Rail Development Officers, Brian Haworth and Simon Clarke and two Community Rail Education Development Officers, Daisy Chapman-Chamberlain and Karen Bennett and a part time Special Needs Education officer, Katie Musgrove, who are funded by contributions from Arriva Rail North and other partners. Richard started out as a history teacher but was the ‘father’ of many rail user groups in the 1980s & 90s including the Ormskirk & Preston Travellers Association (OPTA & now the Ormskirk, Preston & Southport Travellers Association OPTSA), Ribble Valley Rail (RVR), the South Fylde Line Rail Users Association (SFLRUA) and the Lancaster and Skipton Rail Users Group (LASRUG). He was also involved in the creation of many Friends of Stations groups and Station Partnerships well before the rest of the country caught on to this idea. His role as Rail Development Team Manager with LCC has seen him involved in the creation of three transport interchanges at Burscough Bridge, Carnforth and Clitheroe and also the County’s project manager in the building of Accrington Eco Station and the new station build at Buckshaw Village, between Leyland and Chorley. Brian is an engineer by trade and has been a rail enthusiast all his life and joined Lancashire County Council around nine years ago as a Community Rail Development Officer. He has been closely involved with the work the CRPs do with schools and is the voice of the eponymous Brian the Bull, star of two DVDs. He also oversees the volunteers that carry out work on the stations and disused platforms and leads cycle rides and walks that take people to discover the history of Lancashire’s community rail lines. Daisy studied geography at the University of Lancaster, graduating in 2013 with a focus on Geography in Education and British Landscape and Infrastructure. 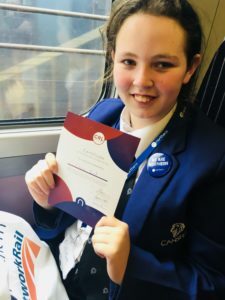 She then took her PGCE at Bishop Grosseteste University College in Lincoln, and went on to teach in Key Stage One in schools in Bolton and Stretford, before joining Community Rail Lancashire. During these years she has worked with a wide range of charities and groups including Barnardo’s children’s charity, Riding for the Disabled, the National Trust and within the House of Lords. She is particularly focussed on promoting exciting, holistic rail education programmes to children of all ages, encompassing practical rail use, history and environmentalism, with the goal of increasing diversity and inclusion in transport nationally.